Image caption Netanyahu fears "repressive regimes of radical Islam"
Israelis are watching anxiously as anti-government protests continue in Egypt - one of the country's only friends in the Arab world. "Judgement Day" for President Hosni Mubarak was the full-page headline jumping from the Hebrew-language newspaper Yedioth Ahronoth in Israel on Tuesday. The implications of regime change in Egypt would be enormous here. "We are concerned. We are watching this very anxiously," says Dan Gillerman, a former Israeli ambassador to the United Nations. "This is a very, very tough neighbourhood," he says. "We are already facing Hezbollah in Lebanon, Hamas in Gaza and the prospect of, God forbid, an autocratic, fundamentalist, Islamic organisation taking over in Egypt is obviously not something we can ignore." Mr Gillerman is talking about the Egyptian Islamist movement, the Muslim Brotherhood. Many analysts would disagree with his description, seeing the Brotherhood as a conservative, but more moderate, Islamic organisation. But Israel is talking up the threat. "What could develop and which has developed already in several countries, including Iran - repressive regimes of radical Islam - that is the fear, of all of us," said Israeli Prime Minister Benjamin Netanyahu on Monday in his strongest comments yet on the Egyptian crisis. The Muslim Brotherhood has so far taken a back seat in the Egyptian uprising. But Israel's fear is that if there were to be fresh elections in Egypt, the party could do well and even win. Israel is proud of its own democracy. It is perhaps not so keen on what democracy could deliver on its doorstep. What Israel wants is regional stability and President Mubarak has delivered that. For three decades, President Mubarak has been the closest thing Israel has to a friend in the Arab world. Egypt was the first Arab country to sign a peace treaty with Israel in 1979. US President Jimmy Carter brought together the Egyptian and Israeli leaders Anwar Sadat and Menachem Begin to sign a historic deal. That treaty has endured. But it's sometimes called a "cold peace" because of the lack of enthusiasm for the deal among Egypt's population. Indeed, President Sadat was assassinated in 1981 by Islamic extremists opposed to the treaty. His successor was President Mubarak. For three decades, Israel has not really had to worry about its powerful southern neighbour. That has changed now. "Israelis are extremely worried that we are going to get the Muslim Brotherhood on our border," says Gil Hoffman, chief political correspondent for the Jerusalem Post. "The Israeli army has not budgeted anything over the last 30 years for dealing with a strategic threat from Egypt." Israel shares a long border with Egypt and both have a frontier with the Gaza Strip. Israel and Egypt have been blockading the Palestinian territory for more than three years. The blockade is aimed at weakening the Islamist movement Hamas which controls Gaza. Hamas is an offshoot of Egypt's Muslim Brotherhood. Israel is worried that if there is regime change in Egypt, the border with Gaza will be entirely insecure. President Mubarak is clinging on, but Zvi Mazel, a former Israeli ambassador to Egypt who knows the Egyptian leader well, says the writing is on the wall. "He's finished. It's over. Even if he remains for a little longer, he's lost all his influence and authority. He should have gone five or six years ago." Mr Mazel believes the best option for Israel could be Omar Suleiman, the former Egyptian intelligence chief who's just been appointed vice-president. Mr Suleiman is someone Israel knows well. 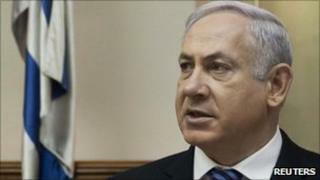 He has played a key role in Middle East peace talks with the Palestinians over the years. The question is whether Egyptians would settle for him. For the moment, Israeli eyes are anxiously looking south. But there are also fears regime change in Egypt could destabilise the whole region. Other Arab countries could follow suit. Jordan is one obvious place to look next. There have already been protests there against the rule of King Abdullah. Jordan has relatively good relations with Israel. The two countries signed a peace treaty in 1994. But Israel could end up with uncertainty on all sides.